Features the wonderful fiddling of David Greenberg (one of the only violinists in the world who convincingly "goes both ways" Puirt a Baroque (poorst-a-ba-roke) is an ensemble that brings a new and delightful perspective to both Baroque and Scottish-Cape Breton musics. Many of you will recognize David Greenberg ... either in his past life as one of the lead violinistsfor Tafelmusik or in his role as the co-author of The Dungreen Collection (a collaboration with his wife, Kate Dunlay). David Also has a traditional fiddling album, titled Tunes Till Dawn. 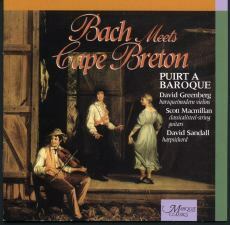 Bach Meets Cape Breton is Puirt a Baroque's first CD and it is a classic. To many traditionalists fusion is a dirty word ... but this actually works. Who would think a medley could flow from Bach into a reel as naturally as strathspey to reel? David Greenberg - violins, Scott Macmillan - guitars, and David Sandell - harpsichord. Suite from Ayres for the Theatre by Henry Purcell, with a Cape Breton "chaser"